Welcome to our latest article – Lost in Paradise! – Cairns The Great Barrier Reef Australia! With this article, we have tried to capture the feeling, the sensation of what it is like to live in our little tropical paradise! If you live in a big city apartment block, busy, noisy, smoggy air, icy cold and snow outside! Relax your mind, let us take you on a journey into the feelings you can expect if you lived in a Tropical Paradise like Cairns, The Great Barrier Reef, Australia! Cairns is a spectacular little town, I like to call it a village locked between two World Heritage listed National Parks. About 180k people live in and around Cairns. We are located in the state of Queensland, North Eastern Australia. For the size of the town, Cairns really punches above its weight, especially when it comes to Tourism compared to other parts of Australia! Cairns has a relaxed laid back lifestyle, you will feel this in the people you meet. The following typical Australian sayings are used regularly “Shell be Right Mate” and “Don’t Worry, all Good!”. 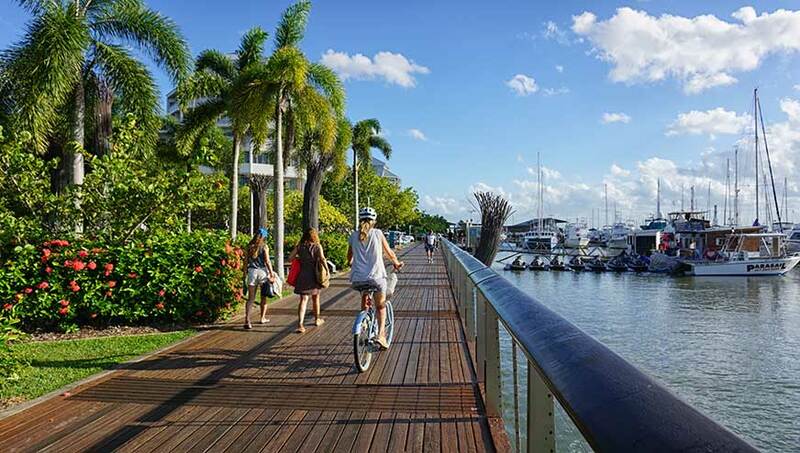 Cairns Esplanade Waterfront Boardwalk, great for walking and riding your bike. The laid back lifestyle that comes from living in Cairns can be attributed to the local weather conditions. Most days are hot, sunny, blue sky days, large open spaces, tropical sea breezes and thick tropical rainforest surrounding the city. Not to mention some of the best snorkeling and diving in the World on the largest living reef system on the planet just a short boat trip offshore. There is great shopping for the girls in Cairns Central and downtown shops in the city centre. There are great bars and nightclubs to boogie away to the wee hours of the morning. There are fantastic breakfast cafes to kick start your day! Beautiful restaurants can be found all along the Cairns Esplanade Waterfront boardwalk! Cairns has one of the largest Reef Tour operating ports in Australia! Just over 80k people traveled thru the Ports North Marlin Marina Terminal in January this year alone! There are over 25 different reef tour companies operating from the Cairns Marlin Marina. Cairns has a large global feeling in a small town, there are many different nationalities all living and working together in Cairns. You will find people from Germany, France, Holland, Italy and England all working together side by side in the many cafes and restaurants. We also have the Asian cultures of Japanese, Korean, Taiwanese and Chinese also all working together in the many Tourism companies, reef day boats, cafe’s and restaurants! Just walking down the street on any given day you will hear at least 5 different languages being spoken. This mix of so many different cultures makes Cairns the perfect melting pot for global Cuisine! The tourism industry in Cairns employees thousands of workers both Australian and International staff. Often people come to Cairns for a working holiday and fall in love with this little slice of Paradise and decide to stay. The attraction of The Great Barrier Reef is one of the main reasons people stop for a while.The easy access of getting out to The Great Barrier Reef and trying snorkeling or diving is a dream come true for most people. Just North of the city you have beautiful beaches like Trinity Beach and Palm Cove. Keep driving along the main highway now called The Great Barrier Reef drive and you arrive at Port Douglas. A beautiful little 5 star village tucked alongside 4 mile beach! To the West of Cairns you have spectacular World Heritage listed National Parks. Some of the planet’s oldest living Rainforest are found here in Cairns! With hot, sunny tropical days and cool light hearted evenings, Cairns is the perfect place to live in a low-stress relaxed lifestyle …… Lost In Paradise! If you would love a laid back relaxed lifestyle where the vibe is about enjoying yourself, it’s not about stressing about money, finance, fame, and fortune. It’s about great wine, great food and good people gathering together from all parts of the World. This is why thousands of visitors come to Cairns for their holidays each year, they come to relax and enjoy the laid-back tropical lifestyle that is Cairns. This is why we love being Lost In Paradise! Come and visit Cairns see for yourself, relax and unwind, we know you won’t be disappointed! View our range of Cairns Tour Packages to get you started on exploring this magnificent part of the World!